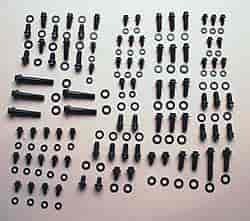 It's easy to assemble a show-quality engine when you use ARP's handy Engine & Accessory Fastener Kit. Virtually everything you need comes completely organized in one convenient package (no need to deal with twelve different part numbers)! More importantly, each and every fastener is superior in strength to the OEM bolts, and also significantly better than hardware grades (even Grade 8). You have a choice of two premium quality materials and finishes. .
Traditionalists will appreciate the strength and functionality of ARP's heat-treated 8740 Chrome Moly steel alloy bolts, which feature a black oxide finish. Those who desire a dazzling engine will no doubt prefer fasteners made of ARP's specially alloyed Stainless 300 material, which has the added benefit of being virtually impervious to rust and corrosion. The stainless steel is polished to achieve a brilliant luster, and provides a distinctive, maintenance-free environment. Each kit has a dozen different type fasteners, all neatly organized and labeled in protective vacuum-wrapped packages. Both materials are nominally rated at 170,000 psi tensile strength and come in both hex and 12-point heads. Save Time, Money and Hassles! Everything you need to attach components and accessories from a long block on up is packaged in one economical, convenient kit! Please note that these kits are designed for carbureted engines. Newer EFI applications may require the purchase of additional fasteners. Does ARP 535-9801 fit your vehicle? 535-9801 is rated 3.5 out of 5 by 2. Rated 4 out of 5 by Codi from There are cautions buyers are not aware of My Chevy 468 is all ARP internally and I wanted continuity in its appearance. I used all ARP hex black oxide bolts for the exterior. It's the look I wanted. While building the engine, I learned some bolts in this kit are just to short. The kit is fine for "stock" exterior engine pieces (sheetmetal). If using a one piece pan gasket (thicker), you need longer pan bolts. If using Energy Suspension motor mounts, you need longer bolts. Using cast aluminum valve covers, you need longer bolts. I contacted ARP directly and the tech was great to work with. He was aware of these issues and ARP offers the bolts, however neither Jeg's or ARP mention this in their descriptions. ARP sent me the needed replacements at no cost and I received them in three days. Very fast service and I have the continuity I wanted in my engine appearance. Rated 3 out of 5 by Codi from Couple things to be aware of No argument that ARP are the best bolts/studs available. The package is for stock engine items. If you are using thicker gaskets or aluminum valve covers, you need longer bolts. I found this out while building my engine. I contacted ARP who sent me proper length bolts very quickly and at no charge. ARP was great to work with and I have no issues with Jegs, but it should be noted in the catalog before you buy.